Singapore – Yet another road traffic accident by a driver running a red light recently occurred when a taxi driver allegedly sped past the stop signal and hit two pedestrians, aged 26 and 54, who then had to be rushed to the National University Hospital. 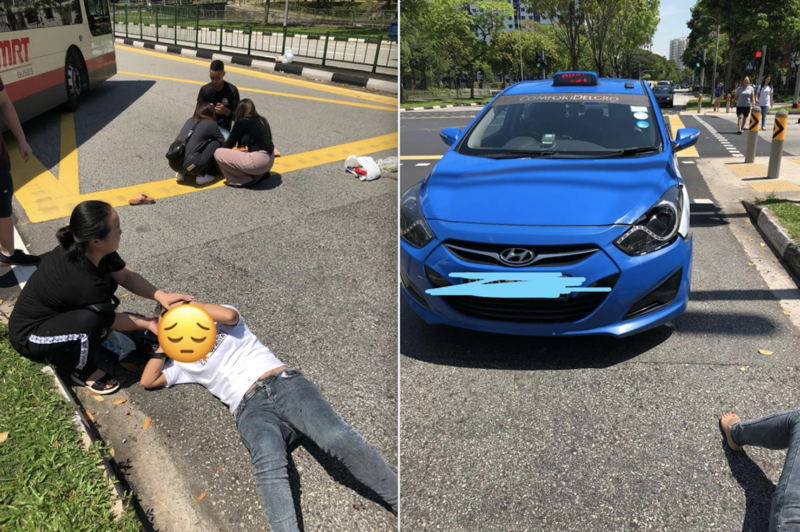 As an eyewitness’ horrified accounts and pleas for more pedestrian safety awareness made the rounds on social media, ChannelNewsAsia reported that police arrested the 63-year old taxi driver for dangerous driving while taxi company ComfortdelGro suspended him. On April 13, 2019, eyewitness Cassendra Tay related how the pedestrians, who had merely wanted to cross the road, were sent flying a split second after the taxi driver beat a red traffic light signal. We were on our way to Jurong Point for a lunch meeting and……. We were driving behind. And realized the taxi driver beat the RED light. And I meant it wasn’t amber light to red light. It was already red light and the taxi driver still drove and hit the 2 pedestrians that were crossing the road! Both flew sideways and their head fell hard onto the road. Both were bleeding profusely. They couldn’t move or respond to us much. We were so worried. Passer-by were helpful to pass umbrella, tissue and picked up their groceries. Thank god ambulance came around 10 minutes. Please everyone, remember!!! DO not use your hand phone while crossing the road!!! Check left/ right before you cross even when the green man shows up!! There are many drivers whom just drive blindly without checking!! Remind your family members and love ones!! I wish the victims a speedy recovery. Police investigations are ongoing, said the Singapore Police Force, which was alerted of the accident that occurred on the junction of Jurong West Street 64 and Jurong West Central 3 at 11:36 am. ComfortDelGro’s group chief communications officer Tammy Tan added that the driver had been suspended. “We are deeply sorry to learn about this accident and have suspended the driver with immediate effect,” Tan said. “The welfare of both pedestrians is currently our top priority. We are already in touch with both pedestrians and will assist them the best we can. We are also assisting the police in their investigations,” she added. In a recent article by motorist.sg, the top reasons why road accidents occur in Singapore were observed. At the top of the list was distracted driving. Anything from a smartphones or GPS system tends to divide a driver’s attention when it should be 100% on the road. According to Data.gov.sg, in 2016 (the latest available data) alone, there were 2,729 accidents and 41 deaths due to distracted driving. Next on the list is reckless or drink driving with 1,058 accidents and 36 fatalities in the same year. The third reason is an easily avoidable one: failure to give way to traffic with the right of way. This form of accident occurred 882 times with eight fatalities in 2016. Another cause of accidents, also avoidable, is changing lanes without due care which resulted in 467 injuries and four fatalities. Lastly, we have disobeying traffic light signals or attempting to beat red lights. Once more an easily circumventable accident yet had 112 accidents and eight fatalities in 2016.